GLB® Pool offers the advantages of bromine sanitizing with its 1” Brominating Tablets. 1” Brominating Tablets provide increased sanitizing in a wider range of pH levels than chlorine while being less irritating to the skin and eyes. Use with automatic feeders. With 56% available stabilized chlorine, GLB® Granular Dichlor offers easy pool sanitation in a fast-dissolving formula. It’s ideal for daily chlorination and does not contain calcium. These large 8-ounce sticks provide 90% available stabilized chlorine. They are slow-dissolving and are ideal for floaters, feeders or skimmers. GLB® Super Charge II is a highly effective, multi-purpose product that sanitizes, prevents algae and shock treats your pool. It is convenient, easy to use and won’t over-stabilize your pool. Contains 47% available chlorine. GLB® SuperSonic is a highly effective multi-purpose product that sanitizes, clarifies, prevents algae and shock treats your pool. It is convenient, easy to use and won’t over stabilize your pool water. The fast-acting formula can be used on all pool surfaces, does not contain cyanuric acid and leaves no residue. Slow-dissolving ½ ounce tablets provide powerful chlorine sanitization. 89% available stabilized chlorine. Algae-X is a non-foaming multipurpose 30% polymer algaecide that treats green and mustard algae. It is effective over a wide pH range. This copper/quat formula eliminates the toughest black algae. Its patented triple-chelation process holds copper ingredients active in solution for longer algae control. Swimming can commence immediately after treatment. This is the one algaecide that does it all. Algimycin® 2000 algaecide kills, prevents and controls all algae types. A special wetting agent penetrates and kills even deeply-rooted algae cells. This nonmetallic, poly-complex formula gives fast and effective control with no foaming or staining. It also acts as a clarifier and filter aid by removing algae fast. If used weekly, it prevents algae outbreaks in the pool. Algimycin® 2000 algaecide is also part of our No Algae. Guaranteed. Program which guarantees an algae-free pool all season long if a GLB® sanitizer, Algimycin® 2000 and Oxy-Brite® shock oxidizer are used as part of the regular pool maintenance program. For a simplified approach to seasonal algae protection, GLB? Offers this non-foaming, non-metallic winter algaecide to ensure a hassle-free opening in the spring. Designed to control green and mustard algae, this chelated 7.4% copper algaecide is effective and economical. Water care products for maintaining proper levels of pH, alkalinity and calcium hardness. Add sparkle to your pool with water care products that keep water crystal clear. This super-concentrated clarifier adds sparkle while removing particles that dull pool water. Clear Blue® clarifier improves filter efficiency and reduces sanitizer demand by removing organic particles that clog filters without affecting pH levels. Environmentally-friendly Natural Clear® enzyme clarifier is a biodegradable water cleaner. It quickly rids pools of organics that cause odors, sum lines, filter clogs and cloudy water. Sequa-Sol® sequestering agent holds iron, manganese, copper, and calcium in solution so they don’t react with other elements in the water. It prevents staining, scale and rust on pool equipment, pipes and fittings. This granular formula quickly eliminates metallic stains from pool surfaces with no need to test the water or close the pool. It is safe for all types of pool surfaces. This concentrated granular is specially formulated to protect pool surfaces from minerals in the water and is ideal for use with hard water. It is also great for pool openings or when adding make-up water. The Ultima® NIX* formula is the industry’s first combination algaecide and phosphate remover. This powerful dual action product is designed to keep your pool free of algae all season long by reducing phosphates and eliminating algae. It is compatible with all sanitizing systems and, best of all, swimmers can resume pool use immediately after treatment! **The full name for Ultima® NIX is Ultima® NIX Total Control Algaecide. Ultima® T.K.O. is a fast-acting, quick-dissolving, multi-purpose granular product that sanitizes, clarifies, prevents algae and shock treats your pool. Its highly effective formula is convenient, easy to use and wont over stabilize your pool water. Ultima® T.K.O. can be used with all pool surfaces, does not contain cyanuric acid and leaves no residue. One Product. One Treatment. One Clean Pool. Ultima® Total Control shock and algaecide is a fast-acting shock and algaecide in one formula. It combines the anti-algae power of chlorinating compounds and chelated copper for immediate and extended relief from black, green and yellow algae. It shock treats at the same time, leaving your pool crystal clear and contaminant-free. Shock water with either chlorine or non-chlorine formulas. GLB® Super Charge is 68% Active Calcium Hypochlorite granular formulated especially for super chlorination shock treatments. 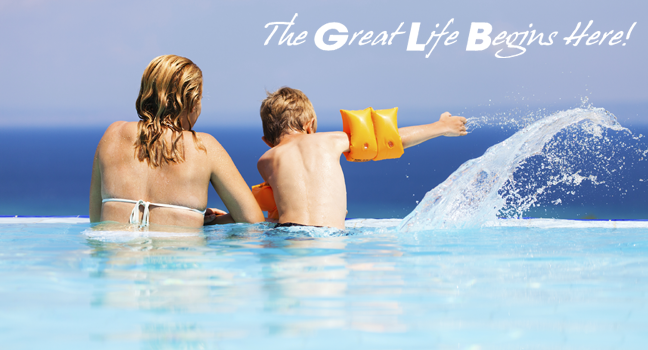 GLB® Super Charge contains 65% minimum available chlorine. GLB® SuperSonic is a highly effective multi-purpose product that sanitizes, clarifies, prevents algae and shock treats your pool. With 73% available chlorine, this granular product is convenient, easy to use and wont over stabilize your pool water. The fast-acting formula can be used on all pool surfaces, does not contain cyanuric acid and leaves no residue. Oxy-Brite® non-chlorine shock oxidizer creates sparkling water and shock treats in one step. Containing DuPont® Oxone®, a powerful oxygen-based oxidizer, its powerful formula rids pool water of contaminants that cause odor and irritation, and brightens and clears the water with unique blue water brightening crystals. Shoxidizer® shock oxidizer is a 4-in-1 proprietary blend of DuPont® Oxone®, a powerful oxygen-based oxidizer, and a dry clarifier. This unique formulation provides the benefits of oxygen-based oxidation while boosting free chlorine concentrations. This one-two punch keeps water sparkling clear and clear by eliminating organic contaminants. Chlorine, bromine, ozone, and salt water sanitizing systems.